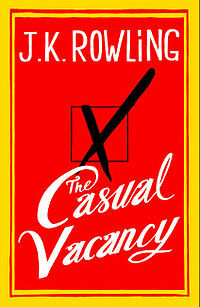 I picked up The Casual Vacancy because of my love for J.K. Rowling's previous books. This is not my normal genre of reading choice, but I thought good writing would make it enjoyable. I know this is not a MG or YA Fantasy, and I'm not going to knock it stars because it isn't. The problem with this book is that it doesn't have the magic I came to expect from her. No, not the wizarding magic from a wand, but the magic of writing moving words to change hearts and inspire minds. It wasn't the language or adult subject matter, which I've heard was a turnoff to several potential readers, but it was the characters. Actually, I quite enjoyed the characters from the first chapter of the book. They seemed real to me and the story started off gripping. But then the book introduced a ton of characters and it takes a while to see how they all interconnect with each other. In fact, she would spend so much time introducing characters that by the time you got back to ones she had already introduced I had trouble remembering much about that person. By the middle of the novel I started catching on, seeing how different each character was, what their goals were, and how they all related to each other in the story. In the meantime, I didn't like how nobody was happy. Yes, I know that happy characters don't make for a compelling story, but these characters were all extremely gloomy and depressed. I noticed, while reading this book, that I started feeling depressed as well. There was very little that I found uplifting in this book. Once I muscled through the introduction of characters things started happening. Yeah, that's right; things don't really start rolling until about two-thirds of the way into the book. At that point the story does work its way to a pretty climatic and emotional ending. No, I didn't cry or anything, but I did feel the pain I would have felt if such events had happened in my own community. Ultimately, the ending didn't justify the journey it took to get there. If this were anybody else I would have given up reading this book in frustration long before the halfway mark. But because of the magic she has worked in me before, I gave her the benefit of a doubt. I think I'm being generous giving this three stars. It isn't because this didn't measure up to Harry Potter, but this just didn't measure up to good writing. ...but you really did cry at the ending, didn't you? It's okay to admit. I still want to read this, just because. At least now I know what to expect. Thanks!